. The new dock – which resembles a conventional speaker in every way – uses amplifier technology from Creek and a drive unit licensed from highly respected speaker company Epos. And at just £399, the dock offers iPod users a slice of hi-fi prestige for a very modest outlay. Despite the low price, the two-way AktiMate Mini has a comprehensive feature list. High amongst them is compatibility for all iPods and a flexible range of connectivity options to include auxiliary inputs – enabling the connection of other sources – plus auxiliary outputs. 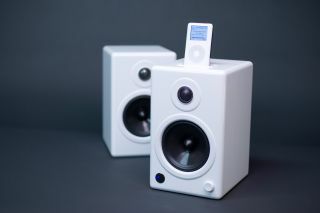 You can also connect the speaker to a suitable panel to display the iPod’s video content. There’s far more to the Creek/Epos tie-in, too. The AktiMate was, in fact, designed by Creek founder / Epos owner Mike Creek, who has licensed a number of designs to the new company. The speaker will use a 130mm polypropylene driver of Epos origin, a 25mm metal dome tweeter – also from Epos – plus a 40-watt Creek-designed amp, which is built in to one of the speakers in a slave / master configuration.